Everest Base Camp and Gokyo Lakes Treks is an extended part of Everest Base Camp Trek which combines visit to the world's giant rocky peak - Mount Everest, world's highest freshwater lake - Gokyo Lake, and a Hidden Valley - Gokyo Valley located at Solukhumbu District under Sagarmatha National Park (Natural World Heritage Site) in north-eastern Nepal. Everest Base Camp and Gokyo Lakes Trekking is also popularly known as EBC Cho La Pass Gokyo Trek. Situated at the foot of Gokyo Ri, Gokyo is a small village located at an altitude of 4,750 meters (15,580 ft) above sea-level. 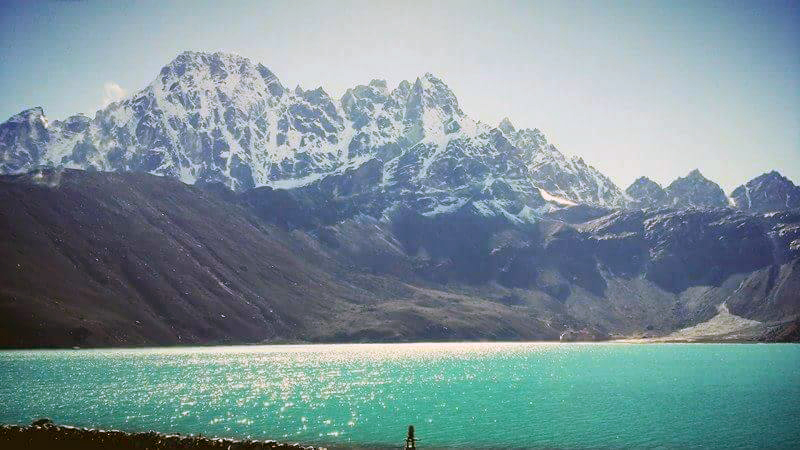 Gokyo Village is also considered as the highest settlements in the world. The main attraction of including Gokyo in EBC Trek is to observe the sacred Gokyo Lake (worshipped by Hindus and Buddhists as Snake God) and to discover a panoramic view of the four above 8,000 meters snow-capped peaks: Mt Everest, Mt. Lhotse, Mt. Makalu and Mt. Cho Oyu. The trail can be considered as a circuit of Everest Region Trek. The trekking path sperate from Namche Bazar and head up to Phortse Thanga. After another two days hiking, Gokyo Valley will be reached. Then, next three days walk will join Everest Base Camp Trek route at Lobuche. Afterward, visit the base camp of Mount Everest and trek down to Lukla crossing Dingboche, Tengboche and Namche Bazar. Day 04: Trek to Phortse Thanga. Day 06: Trek to Gokyo. Day 07: Acclimatization day at Gokyo Valley. Day 08: Trek to Cho La Pass to Dzongla. Trail Attractions: Hike to Gokyo Ri and cross Cho La Pass. Day 10: Trek to Everest Base Camp and stay at Gorakhshep. Day 11: Hike to Kala Patthar, trek down to Pangboche. Day 12: Trek to Namche Bazar. Day 13: Trek to Lukla. Wants some modification on Everest Base Camp and Gokyo Lakes Trek itinerary? contact us to customize it.